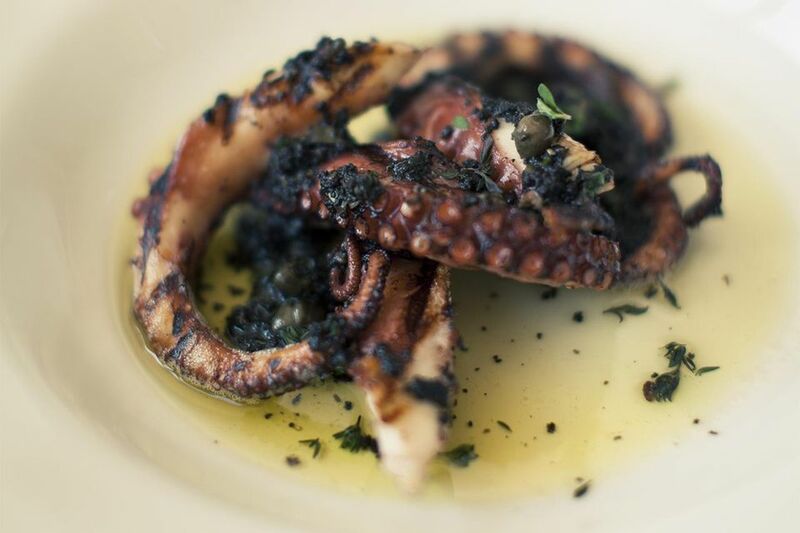 Don't be scared off by the fact that this Greek dish requires whole baby octopus. The rich, meltingly tender taste of the marinated octopus mixed with the smoky taste of the grill makes believers out of skeptics. This is a great seafood dish to prepare when the weather gets hot. Place octopus, olive oil, lemon juice, lemon zest, salt, pepper, oregano, and garlic into a plastic bag or container with a tight-fitting lid. Massage the marinade into the octopus and put it in the fridge for a full day. Massage it every now and again. Fire up the grill. If you have a gas or charcoal grill, it is vital that you add some kind of wood smoke. If you fail to do this, the dish becomes far less interesting. One way is to soak hickory sawdust overnight and then dump it into a makeshift bowl made from heavy-duty foil. While the grill is heating, skewer the little octopi. It's a good thing if some of the herbs or garlic from the marinade sticks to the octopus, but not essential. Grill over the smoky fire, covered, for 3 minutes, then turn them over and grill for 3 minutes more. Serve while still hot with lemon wedges on the side.